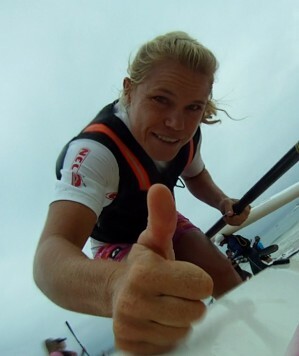 Cradock – Eastern Cape canoeing icon Michéle Eray has dropped a bombshell by withdrawing from the Hansa Fish river canoe marathon next weekend, making her unable to defend the title she won last year with her doubles partner Robyn Kime, and leaving Kime scrambling for a new partner for the race. A devastated Eray is battling to deal with a crippling tendonitis problem on the back of her left hand that first forced her to abandon her place in the national team to the world marathon championships while she set her sights on being on the startline at Grassridge dam on 7 October for the Hansa Fish. “The Hansa Fish is my local major and when I won it last year it was the first time that an Eastern Cape local had won it since the late great Daniel Conradie nearly fifteen years ago. So I was really keen to try and keep the title in the Eastern Cape,” said Eray. Despite a frustrating and extended rest period and ongoing physiotherapy the tendon injury has not cleared up and Eray has reluctantly had to throw in the towel for the Hansa Fish. “It is incredibly frustrating because it probably the highlight of my year,” she said. As a respected biokineticist and coach to a global group of paddlers Eray also knows that a rash decision to rush back in time for the Hansa Fish will come back to haunt her. Eray is one of a very small band of full-time professional paddlers and needs to balance her calendar of commitments to major races with the basic need to earn a living, making the decision to withdraw from the Hansa Fish a calculated one. She has also thrown the women’s race wide open, leaving the woman she raced to victory with last year up the proverbial creek without a paddling partner.